Real sports fans know athletics aren’t made in the split-seconds of a game-winning play. They’re made in the stories surrounding those heart-pounding moments, and that’s why ESPNcricinfo’s Cricket Monthly is a huge victory. Created as the world’s first digital-only cricket magazine, fans of the ESPN subsidiary log a collective 2 billion minutes with the publication’s website every month. 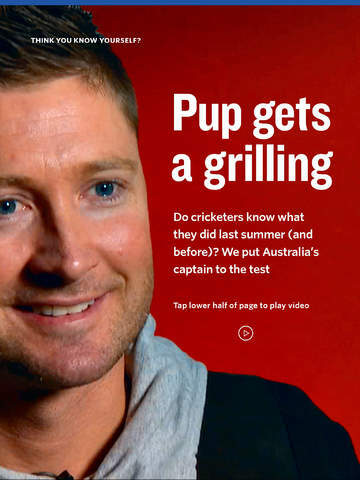 Swipe into the Cricket Monthly app and you’ll immediately understand why. Published the first week of every month and sold on a per issue and subscription basis, the app dives into the sport with immersive slideshows, sends readers behind the scenes with video interviews with superstar players, and annotates action shots with interactive information. Make your way through the Top Ten Drivers article showcasing player stances and form and you’ll know exactly why the Cricket Monthly bowled (or pitched if you’re American) straight into a digital environment. The action shots radiate off retina screens and the swipeable layered longform articles feel crisp and fast paced throughout. Six runs (or the equivalent of a baseball grand slam) for the Cricket Monthly. Their bleeding edge content and features are a prime exhibit of interactive magazines at their prime.